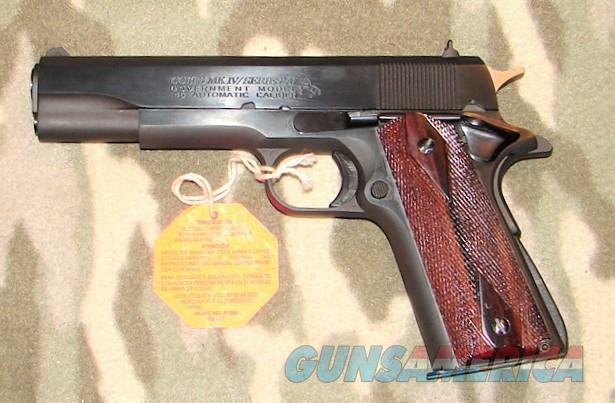 Description: Colt Government Model Semi-Auto Pistol serial #71B0605, 45 ACP, 5" barrel with an excellent bore. This pistol appears to be as new in the box. The metal surfaces of this early 1980's Mark IV Series 70 pistol retain about 99% plus original blue finish. The double diamond checkered hardwood grips rate excellent. This is a standard Government Model configuration with drift adjustable high visibility black sights, short trigger, arched mainspring housing and later solid bushing. The pistol includes a factory hard case correctly end labeled and number to the gun, a pair of factory magazines, manual, hang tag on the gun, cable lock with a pair of keys and paperwork. A beautiful condition Series 70 pistol.